As you will be notified and restricted when you reach your data limit, there isn't any chance that you can continue to browse the internet and go over your quota, so you can say goodbye to unexpectedly large bills. At least for as long as you remain in the UK. These new plans see the end of out-of-bundle data charges. Three is built for the mobile internet, it’s at the heart of everything we do and that’s reflected in these new plans. Mobile internet usage is continuing to increase at lightning speed, customers are beginning to prioritise data and they rightfully expect their network to allow them to do so without hitting them with extra charges. All of the phones which are currently available with the new tariffs are shown in the grid below. Of course, when new models are released they will also be added to these plans too. 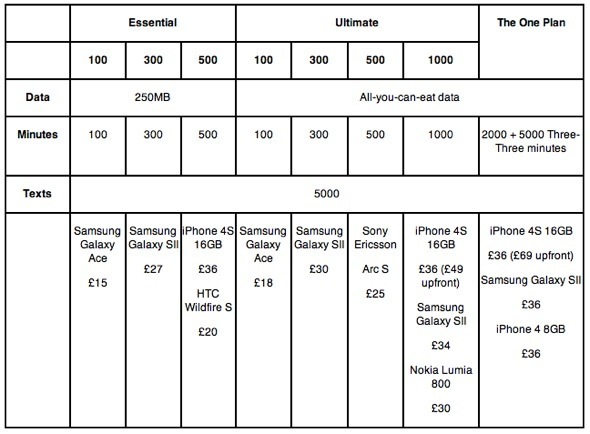 It's great to see Three pushing all-you-can-eat data on their cheaper tariffs as well as the more expensive One Plan; hopefully other carriers will start to follow suit in the future, but I wouldn't hold your breath just yet.